Gar is the common name for any of the mainly freshwater, heavily armored fish comprising the family Lepisosteidae in the bony fish order Lepisosteiformes (or Semionotiformes), characterized by an elongated body and jaws, needlelike teeth, and scales that are heavy, hard, and diamond-shaped. Gar range in size from about .6-3 meters (2-10 feet) in length. Gar inhabit freshwater, occasionally brackish water, and very rarely marine water in eastern North America, Central America, and the Caribbean islands (Nelson 1994; Sterba 1962). The family includes seven living species of fish in two genera, Atractosteus (broadhead gar) and Lepisosteus (slender gar) (ITIS 2004a, 2004b, 2004c). Gar fulfill a role of bi-level functionality in the ecosystem and for humans. Ecologically, they are important predators, meeting their nutritional needs to sustain survival, growth, and reproduction while helping to balance populations of such prey species as smaller fish and invertebrates (crabs and frogs). Additionally, the young gar are consumed by larger fish, mammals, and predatory birds. (Adult gar have few predators, based on their armor of thick, hard scales.) For humans, gar, albeit extremely bony, is consumed in some regions of the New World (Grande 2008), and also is a popular sport fish and aquarium fish, particularly in public aquariums given their large size and unique form and behavior. Gar are also known as gar pike or garfishes (ITIS 2004d, 2004e). They are one of only five living families among the ray-finned fish (Actinopterygii) that are not included among the modern bony fish (teleosts of the Division Teleostei). With fragments of fossils tracing to the Cretaceous (about 140 to 65 million years ago (mya)), and complete skeletons known as far back as 110 mya, gar often are referred to as "living fossils" (Grande 2008). Gar bodies are elongated, heavily armored with ganoid scales (which are diamond-shaped, shiny, hard, and of a specific multi-layered composition), and fronted by similarly elongated jaws filled with long sharp teeth. Tails are heterocercal (having two lobes with the upper larger than the lower and the vertebral column extending into the upper), and the dorsal fins (on the upper side of the body) have few rays and are close to the tail. Gar have vascularized (supplied with blood vessels) swim bladders (Nelson 1994, p. 85). All the gar are relatively big fish, with the alligator gar (Atractosteus spatula) being the largest, reaching a maximum length of about three meters (9.8 feet) (Agbayani 2008; Grande 2008). Even the smaller species, such as Lepisosteus oculatus, are large, commonly reaching lengths of over 60 centimeters (two feet), and sometimes much more (Kodera et al. 1994). As their vascularised swim bladders can function as lungs, most gar surface periodically to take a gulp of air, doing so more frequently in stagnant or warm water when the concentration of oxygen in the water is low. As a result, they are extremely hardy and able to tolerate conditions that would kill most other fish. Gar are found in eastern North America, Central America, and Cuba (Nelson 1994). In North America, they can be found as far north as Quebec in Canada and Montana in the United States and as far west as Montana. Fossil gar are found in Europe, western North America, Africa, Madagascar, India, and South America, indicating that in times past these fish had a wider distribution than they do today. There are no reports of fossil or living gar in East Asia (Grande 2008). Gar usually are found in freshwater and in the shallow and weedy areas of rivers, lakes, and bayous, often congregating in small groups (Nelson 1994; Agbayani 2004). Some species of gar are known to occasionally swim into brackish water or, very rarely, nearshore marine environments (Grande 2008; Nelson 1994). The alligator gar, for example, is caught in the salt marshes of Louisiana and has been observed in waters of the Gulf Coasts (Grande 2008). Likewise, Atractosteus tristoechus, the Cuban gar, enters brackish waters and is sometimes found in the sea (Agbayani 2004; Monks 2006). Gar tend to be slow moving fish, except when striking at their prey. They are voracious predators, catching their prey with their needle-like teeth, often as a result of a sideways strike of the head (Kodera 1994). Gar feed extensively on smaller fish and invertebrates such as crabs and frogs (Agbayani 2008; Grande 2008). Large alligator gar even feed on water birds. Adult gar are large and armored with thick scales, resulting in few predators (Grande 2008). Gar spawning takes place in freshwater, involving external fertilization and the concentration of large numbers of individuals in shoal areas. The black, highly toxic eggs are adhesive and stick to rocks, plants, or the substrate (bottom covering layer). Upon hatching, the larvae use adhesive suckers to stick to objects. No parental care is given to eggs or young (Grande 2008). The gar family, Lepisosteidae, is placed under the Lepisosteiformes (or Semionotiformes) order. Authors often consider both the Lepisosteidae family and the Semionotidae family—the latter only known from fossils (from the Triassic to Cretaceous, 251-65 mya)—to be part of the same order, whether this order is designated Semionontiformes or Lepisosteiformes (Nelson 1994; ITIS 2004d). However, other authors have separated the group into two orders, with the Lepisosteidae placed within Lepisosteiformes, and Semionotidae placed within Semionontiformes (Grande 2008; Nelson 2004). Fossil gar are known from the Cretaceous onwards (Grande 2008). Their primitive traits are their very hard armor-like ganoid scales, a swimming bladder open to the pharynx that can function as a lung, and the heterocercal tail. 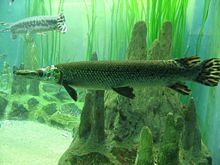 Gar are considered to be a remnant of a group of rather primitive bony fish that flourished in the Mesozoic, and are most closely related to the bowfin, another archaic fish now found only in North America. Extant (living) gar are placed in two genus, with the genus Atractosteus, having three extant species, and the genus Lepisosteus having four exant species (ITIS 2004a, 2004b, 2004c; Agbayani 2004). Members of Atractosteus are sometimes known collectively as the broadhead gar, and members of Lepisosteus as the slender gar (ITIS 2004a). In British English the name gar was originally used for a species of needlefish, Belone belone, found in the North Atlantic, itself likely named after the Old English word gar meaning "spear" (Harper 2001). Belone belone is now more commonly referred to as the "garpike" or "gar fish" to avoid confusion with the North American gar of the family Lepisosteidae (Agbayani 2006), although these common names also are used for members of Lepisosteidae (ITIS 2004d, 2004e). The genus name Lepisosteus comes from the Greek lepis meaning "scale" and osteon meaning "bone" (Agbayani 2004). Atractosteus is similarly derived from Greek, in this case from atraktos, meaning "arrow." Gar flesh is edible, and sometimes available in markets. However, the flesh is extremely bony and not generally used for food, with some exceptions, including the alligator gar being eaten in regions of New Orleans and southeastern United States and tropical gar being a popular food in Guatemala and the Pacific side of southern Mexico (Grande 2008). Unlike the sturgeon, which they resemble, their eggs (roe) are poisonous. The gar is of considerable significance to Native American peoples of the southeastern United States where this fish figures prominently in ceremonial life and music. The ganoid scales historically have been used for arrowheads, jewelry, and ornaments (Grande 2008). Gar are popular sports fish in the southern United States (Grande 2008). Several species of gar are traded as aquarium fish (Kodera et al. 1994). They are popular fish for public aquaria where they are often kept alongside other large, "archaic" fish such as sturgeon and paddlefish. However, a few species, most commonly Lepisosteus oculatus, are sometimes offered to aquarists as pets. The Florida gar, L. platyrhincus, likewise is popular because of an attractive color pattern, and L. osseus and alligator gar also are traded (Grande 2008). Gar do, of course, need very large tanks but in all other regards they are easy to keep. They are not very bothered by water quality or chemistry, and are tolerant of a wide range of temperatures. Gar must be allowed to breathe air, so some clearance between the surface of the water and the hood is essential (Kodera et al. 1994; Sterba 1962). Gar get along well with any other fish that is too big to be eaten (such as large catfish, cichlids, and centrachids). They do not like aggressive tankmates, and despite being predators, are essentially peaceable, sociable fish that do well with their own kind. Sturdy aquarium plants and bogwood can also be used to create hiding places, since gar are very fond of lurking in slightly shady regions (Riehl and Baensch 1997). Feeding presents no problems for raising gar, as most will take all kinds of meaty foods, including mealworms, crickets, earthworms, frozen lancefish and shrimps (defrosted), and strips of squid. Oily fish (like salmon and mackerel), as well as fish guts, will quickly pollute an aquarium but are very effective at tempting newly introduced specimens to eat. Once settled in, many specimens will also eat floating pellets as well. There is no nutritional reason to feed gar live fish, and cheap feeder fish in particular tend to introduce parasites into an aquarium (Monks 2006). Agbayani, E. 2004. Family Lepisosteidae, Gar. FishBase. Retrieved May 22, 2008. Agbayani, E. 2006. Common names of Belone belone. FishBase. Retrieved May 22, 2008. Agbayani, E. 2008. Atractosteus spatula, Alligator gar. FishBase. Retrieved May 22, 2008. Grande, L. 2008. Lepisosteiformes (Gar). NovelGuide. Retrieved May 22, 2008. Harper, D. 2001. Gar. Online Etymology Dictionary. Retrieved May 22, 2008. Integrated Taxonomic Information System (ITIS). 2004a. Lepisosteidae. ITIS Taxonomic Serial No. : 161092. Retrieved May 22, 2008. Integrated Taxonomic Information System (ITIS). 2004b. Atractosteus Rafinesque, 1820. ITIS Taxonomic Serial No. : 201896. Retrieved May 22, 2008. Integrated Taxonomic Information System (ITIS). 2004c. Lepisosteus Lacepède, 1803. ITIS Taxonomic Serial No. : 161093. Retrieved May 22, 2008. Integrated Taxonomic Information System (ITIS). 2004d. Semionotiformes. ITIS Taxonomic Serial No. : 161090. Retrieved May 22, 2008. Integrated Taxonomic Information System (ITIS). 2004e. Lepisosteiformes. ITIS Taxonomic Serial No. : 650224. Retrieved May 22, 2008. Kodera, H., T. Igarashi, and R. Uchiyama. 1994. Jurassic Fishes. Neptune City, NJ: T.F.H. Publications. ISBN 0793800862. Monks, N. (ed.). 2006. Brackish Water Fishes. Neptune City, NJ: T.F.H. Publications. ISBN 0793805643. Nelson, J. S., E. J. Crossman, H. Espinosa-Pérez, L. T. Findley, C. R. Gilbert, et al. (eds.). 2004. Common and scientific names of fishes from the United States, Canada, and Mexico. American Fisheries Society Special Publication, no. 29. Riehl, R., and H. Baensch. 1997. Aquarium Atlas. Microcosm. ISBN 1890087068. Sterba, G. 1962. Freshwater Fishes of the World. Vista Books. This page was last modified on 17 September 2008, at 15:57.